Dr Stephen Suster received his Bachelor of Dental Surgery from Sydney University in 1983. Since then, he has completed various trainings and courses in areas such as orthodontics, TMJ disorder management and cosmetic dentistry. He became a dentist because he enjoyed working directly with different people and the mixture of dexterity, artistic challenges and diagnostic skills that the job entails. Every person is different and presents a unique approach either because of anatomical or personality variation. This means that no two treatment plans are ever the same so my mind is constantly working and challenged. 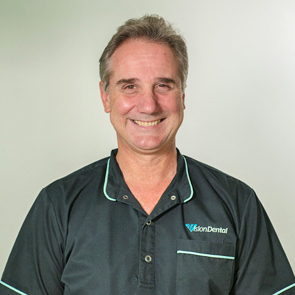 Although Dr Suster excels in cosmetic dentistry, he also has a heart for our Menai families. As a father of three, he has a knack for helping children feel more at ease with the care that we provide and gives parents the information necessary to keep their children’s smiles healthy in the future. But if mum or dad need a smile makeover, Dr Suster knows exactly how to help. Dr Suster volunteers regularly with mission organizations providing dental treatment to children in overseas orphanages. He’s also a sponsor to various local sports teams and the Save the Children charity. You’ll find him at the gym at least three days a week but these days his schedule is mostly filled with games of cricket with his three teenage children, two daughters and a son. Vision Dental is happy to provide same-day appointments for patients of all ages. Contact us today, and be sure to ask about our convenient 0% interest free financing plans!